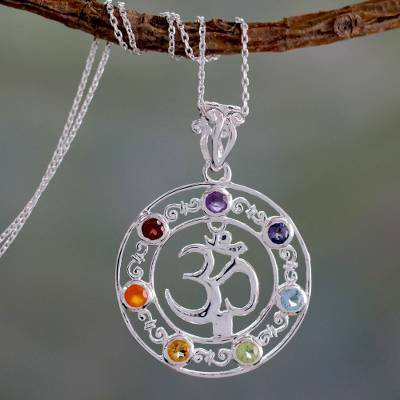 A glistening gemstone halo surrounds the legendary Om symbol in the beautiful medallion of this necklace. From Alok Jain, the seven gems total 6.3 carats and are chosen by virtue of their color, each associated with a chakra point. In this necklace, amethyst is related to both the seventh or crown chakra, associated with wisdom, and the sixth, at the center of the forehead and associated with intuition. Blue topaz and iolite are associated with the fifth chakra, that of communication, and peridot corresponds to the fourth chakra, that of love and compassion. The third chakra's yellow hue of inner power is matched by citrine's glow; and carnelian matches the second chakra, that of emotion and sexuality. Garnet's red glow is associated with the first chakra situated at the base of the spine which corresponds to stability and security. I ordered the Om Magificence chakra necklace about four years ago and only take it off to clean and polish it and to this day it's still as beautiful as when I received it. The workmanship is truly amazing and the compliments I've received are countless! I could go on forever about how much I love this necklace!! !